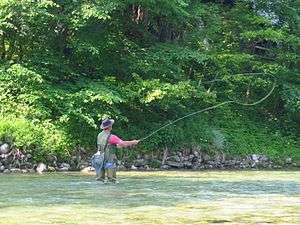 Fly rods normally vary between 2 m (6 ft) and 4 m (13 ft) in length. Fly rods and lines are designated as to their "weight", typically written as Nwt where 'N' is the number (e.g. 8wt, 9wt, 10wt). Rods are matched to the line according to weight. The rod's manufacturer will mark on the rod the fly line weights for which a rod has been designed. One-weight (1wt) rods and lines are the lightest; the weight designations increase up to the heaviest readily available rods and lines at 16-weight (16wt). 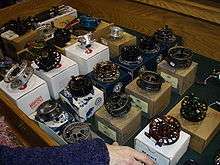 In general, 1wt through 2wt would be in the class used for small trout, and panfish, 3wt and 4wt are popular for small-stream fishing, 5wt is often considered the all-around rod for trout, 6wt and 7wt are used on large rivers and for fishing with streamers, 8wt to 9wt rods and lines might be used for steelhead or salmon in medium rivers, as well as for bass fishing with large flies and as lightweight salt water use, and 10-11wt rods and lines would be used for pursuing large salt water gamefish under conditions of high wind or surf. The heaviest rods (12–16wt) are mostly used for bluewater species (billfish, tuna) while fishing from a boat. The characteristics of these rods reflect the fact that only short casts are needed during this type of fly fishing, while lifting ability is at a premium. The species pursued, under which conditions, will largely determine the weight of rod selected. Next, it is important to match the line to the weight of the rod. Using too heavy a line on too light on a rod, or vice versa, will dramatically affect casting performance. It may also permanently warp the rod blank. Generally speaking, you can safely go one line weight more or less (i.e. using an 8wt or 10wt line on a 9wt rod). There are also rods stamped with a range of weights. For example, a rod may be rated 7-8wt. This indicates the rod is designed for either a 7 or 8 weight fly line. There are also some rods rated for wider ranges (e.g. 8-9-10wt). The drawback to multi-rated rods is that compromises in flexibility or action are made in order to accommodate a wider range of line weights. For example, a rod rated for 8-9 weight line will be slightly stiffer than a straight 8wt but slightly softer than a straight 9wt rod. For more details on this topic, see Bamboo fly rods. Lanyards - Lanyards are used to hold a variety of tools and gadget around the anglers neck. Wading boots - Wading boots provide protection for the angler's feet and typically have some form of gripping mechanism on the sole to provide a margin of safety on slippery surfaces. This mechanism may be made of felt, felt with metal studs, sticky rubber lugs, or synthetic felts.